Please send a 150-word abstract to Catherine Lanone, Bruno Poncharal and Line Cottegnies to synesthesie2018@yahoo.fr by 30 June 2017, with a short biographical note. Since Richard Cytowitc’s 2002 groundbreaking study, Synaesthesia: A Union of the Senses, neuroscience has explored cross-modal associations and simultaneous activations of different areas of the brain which collaborate in the blending and criss-crossing of the senses. Much attention has been paid to the individual nature of synaesthesia, such as grapheme-colour synaesthesia. While a minority of individuals perceive numbers and letters in terms of colours, the actual experience and systematic associations differ according to each subject. Thus synaesthesia, in science or art, provides shimmering displays of singular associations, translations and sensory slippages. This symposium aims to explore the cross-fertilization of the senses from the personal, but also the more collective, viewpoint of Jacques Rancière’s “re-distribution of the sensible”. As sound, sight, touch, hearing blend or morph into one another in art, not only is the very nature of representation at stake, but modes of relation to and interaction between the other and the world. Reflecting philosophical and medical conceptions of the body, synaesthesia in art seems to thrive at certain key historical moments, as if blending the senses also implied ways of redefining self and other in the light of major cultural shifts or turns. Keats’s luscious depiction of sonorous and “billowy” marble, for instance, also moulds cultural appropriation and bears traces of the legacy of Elgin’s controversial take on the Parthenon. Synaesthesia problematizes conceptions of the purity of art, and may be used to distance the Other (through Orientalism and the discourse of exoticism) or to reclaim the Unspeakable (revisiting historical trauma such as slavery). Daria Martin’s work on shared experience, “mirror-touch”, and empathy (both empathetic ways of experiencing art, and ways in which synaesthetic art engages with social problems) points to the way synaesthesia must be, first, revisited as more than a token metaphor, and, second, allowed to branch out in all kinds of different directions. - the specificity of translation: engaging with the translation of the senses raises questions of cultural associations, so that synaesthesia as a trope may crystallize what is involved in translation as speech act. - the periodization of synaesthesia. Marshall MacLuhan connects the exploration of synaesthesia in modern art with electrical technology and media culture. Synaesthesia tropes certain periods (Romanticism, Modernism, contemporary art), raising the question of synaesthesia as a sensory experience, as aesthetic experimentation, but also of the ethics and politics of perception. 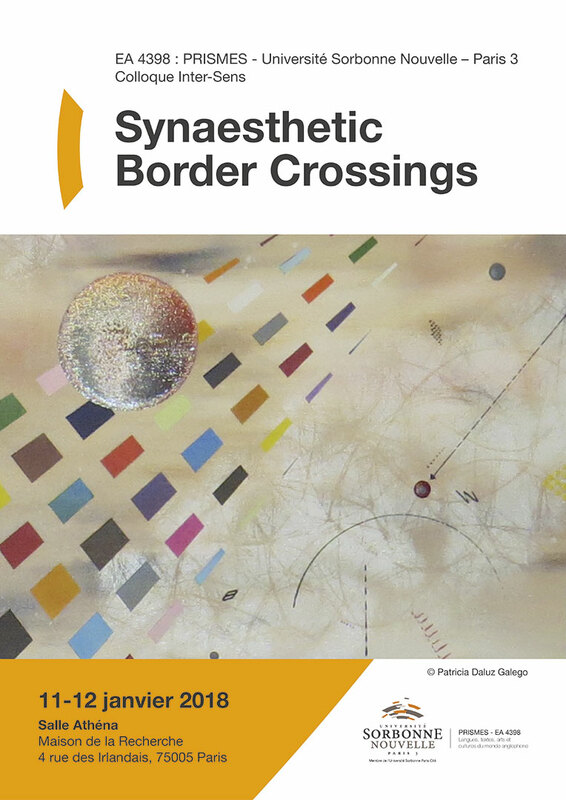 - border-crossing: synaesthesia as ways of modulating distance and empathy, an aesthetic but also a political and ethical tool.